Everybody knows what a NIMBY is, right? The homeowner who blocks all new development with the attitude Not In My Back Yard. If you’re watching the terrific HBO miniseries Show Me A Hero, those are NIMBYs screaming at Yonkers City Council that they don’t want public housing in their area. In some ways you can’t blame them because the form of public housing was so awful. It was in the form of towers concentrating poverty and not giving residents their own defensible space to take pride in. Therefore in Roxborough the Neighborhood Conservation Kit team is operating as NOOFYs, not NIMBYs. We coined the term NOOFY for Not On Our Front Yard. It recognizes that the front yard, a.k.a. the private frontage, really belongs to all of us, because it affects our experience from the public sidewalk – our view, our comfort, our safety. It’s not just my yard, but our neighborhood’s yard. Here’s what’s degrading our neighborhood. Yep, this is the frontage, not the back. The sidewalk, slanted in a continual curbcut for cars. The front doors hidden between garages. Vast impervious surface in a critical watershed. 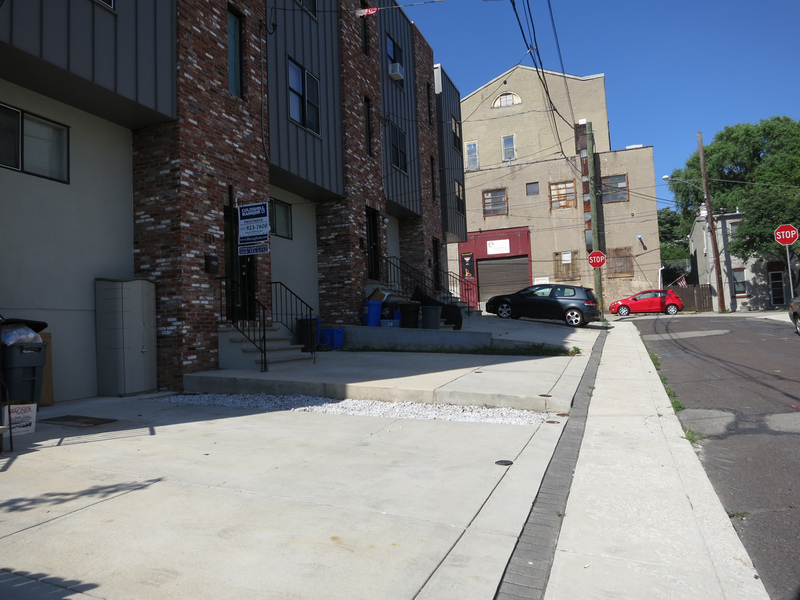 This development interrupts walkable streets where the older houses have friendly frontages: gardens, porches, stoops, approachable front doors, shared parking on the street. NOOFYs and NIMBYs would both try to block this, though for different reasons. NIMBYs are afraid of any change, any increase in density; NOOFYs don’t mind change and density that make the neighborhood better, not worse. In time, maybe NIMBYs can become NOOFYs, developers can become NOOFYs, and NOOFYs can become developers. It has to be better than this. PS Here is a fun NIMBY quiz.